Note: this article was originally written in August. The introduction, immediately below, is new and updates the original article. On August 28 The People’s Water Board Coalition, supported by the American Civil Liberties Union and the NAACP Legal Defense Fund, demanded a temporary restraining order against the Detroit Water and Sewage Department, Two days earlier the department resumed residential shutoffs and disconnected another 600 families. 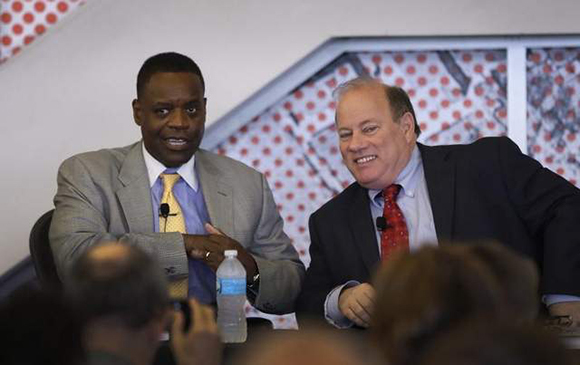 During what turned out to be a month-long self-imposed pause in the water shutoffs, emergency manager Kevyn Orr turned management of the department over to mayor Mike Duggan. For his part, Duggan developed a 10-point plan for improving service and allocated $2 million to aid low-income residents. Corporations chipped in another $200,000. Representing the coalition, Attorney Alice Jennings argued before U.S. Bankruptcy Judge Steven Rhodes that the sole criterion for turnoffs was nonpayment. There were no exceptions if the residence had a person who is disabled, a senior, someone under medical care or children. Instead, Jennings maintained, there should be a moratorium until a meaningful water affordability plan could be implemented. She pointed out there was a difference between a charitable assistance program with considerable requirements and an income-based plan. City attorneys claimed Rhodes does not have authority over the department now that the emergency manager handed control to the mayor Mike Duggan. Judge Rhodes, in the middle of hearings to determine the viability of emergency manager’s bankruptcy plan, ordered the two sides to participate in mediation talks and appointed Chief Judge Phillip Shefferly of U.S Bankruptcy Court to lead the effort. They are to return to his court on September 17, when he will rule on the restraining order. However he not order the DWSD to stop the shutoffs during the mediation process. On July 29, after national and international outcry against shutting off the water of thousands of Detroit residents, governor-appointed emergency manager Kevyn Orr turned over management of the Detroit Water and Sewage Department to mayor Mike Duggan. Under legislation that has been overturned by Michigan voters in the last election but nonetheless passed once again (this time with an appropriation attached so it cannot be challenged by another referendum vote), the Emergency Manager holds all power, and chooses what he delegates to the Mayor. Previously the Mayor commented that the water issue had been badly mishandled. As criticism of the turnoffs mounted, Orr turned the department over to the Mayor as if it was a hot potato. This March the water department had ordered an aggressive campaign to shut off service to residents who owed $150 or were more than 60 days behind on paying their bills. Since the DWSD laid off thousands of workers, it was in no shape to organize the campaign but signed a two-year, $5.6 million contract with Homrich Inc. to turn off — or on — city water. Emergency Manager Kevyn Orr (left) and Detroit Mayor Mike Duggan (right) discussing the water shut offs. While almost 40% of city residents meet the official designation for living in poverty and 30% are unemployed, over the last decade water bills increased by nearly 120%. The City Council recently raised the rate another 8.7% starting this July. Nonetheless the water department set a goal of shutting off 3,000 residential customers each week. By mid-July 17,000 households had been disconnected, affecting approximately 46,000 people. And when a household lacks running water, Child Protective Services can move in and remove the children. Of those disconnected, DWSD boasted that approximately 55% were reconnected within 24 hours. But it also warned those disconnected that they would be treated harshly if they “illegally” reconnected their water. The first offense was to be a $250 fine, rising by the third offense to $660. 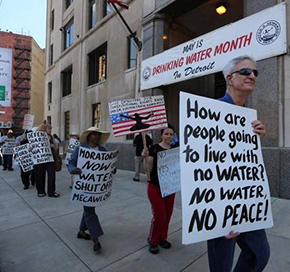 The People’s Water Board, a coalition of organizations that has tracked the DWSD’s policies over the years, publicized Orr’s directives and subsequent water shutoffs. They set up water stations in neighborhoods and a hot line for people to call. They organized pickets at the water department and contacted both the media and organizations in other cities. They wrote to the UN Office of the High Commissioner for Human Rights, to president Barack Obama and to secretary Sylvia Mathews Burwell at the U.S. Department of Public Services. Several organizations, including Detroit Eviction Defense, fanned out into neighborhoods to give residents information about how to get water with or without being reconnected. After much public criticism that past-due commercial accounts did not face shutoffs, on July 9 DWSD informed the press that it was sending notices to more than 200 businesses owing a total of $33.8 million. On their list were two hospitals, a downtown Doubletree hotel, the Detroit Athletic Club and a Midtown Property Group. On two mornings over the next couple weeks a group of activists blocked Homrich’s yards, preventing trucks from leaving. Each time, after a whole morning went by, they were arrested. Unable to arrest Baxter Jones, an activist confined to a wheel chair, the first week, the police ordered a special van to carry him away the second time. But when the group appeared in court, they found the charges dismissed. 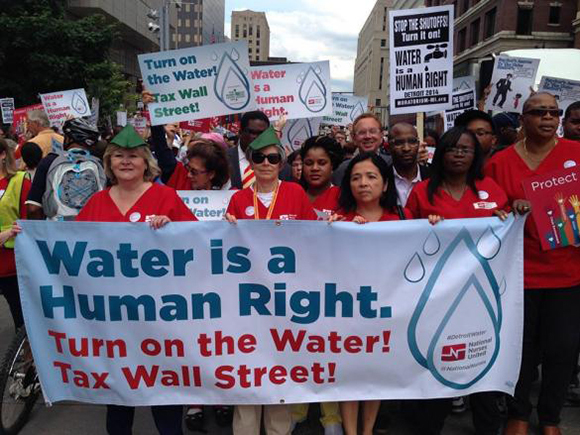 With the Netroots Nation national conference in town, the National Nurses United planned a march through downtown and raised the demands to “Turn on the Water! Tax Wall Street!” They marched in green Robin Hood hunting hats and declared a public health emergency in a city with what were, by then, 4,500 shutoffs. The enthusiastic July 18 march and rally of more than 1,000 was a challenge to governor Rick Snyder and Kevyn Orr. Snyder responded by maintaining a health disaster hadn’t happened yet. Response from Canadians living just across the Detroit was immediate — they organized a caravan to bring 750 gallons of water across the river. Maude Barlow, an expert on water issues, and Paul Moist, president of the Canadian Union of Public Employees, spoke at the welcoming rally. This set the model for other water caravans. The next came from Native People living in the Northwest Territory. At the same time, the local press interviewed residents whose water was still off: a single mother who was forgoing having her water turned on in order to pay for gas and get to her new job while her daughter was staying with a relative; an older African American living on Social Security disability, who took a daily walk to fill a bucket of water, courtesy of a neighbor, with his cane in one hand, the heavy bucket in the other. The Detroit Water and Sewage Depart­ment has existed for more than 100 years and serves not only city residents but 40% of all those living in Southeast Michigan — supplying drinking water to Detroit and 127 other communities and sewage services to 76. For 20 years it had been under federal court supervision to meet the requirements of the Clean Water Act. That supervision ended a little more than a year ago. Two years ago DWSD paid EMA, a St. Paul, MN-based consulting firm, $175,000 to study how the department could improve its operations. The report proposed reducing the work force by 81%, from 1,978 to 374 over a five-year period, adding 361 contract workers. While EMA saw the unionized public employees as having “inflexible job descriptions, multiple reporting levels and a lack of training,” the reality is that workers with experience are capable of handling the various problems that develop in a way that contract workers simply can’t. EMA maintained reorganization — and outsourcing of some operations such as billing — would allow the department to save $900 million over a decade. A second factor impacting water rates is that the federal government has reduced its financial allocation for infrastructural improvements at the same time Michigan has reduced what money cities, towns and counties receive in revenue sharing. While the Environmental Protection Agency recommends that such water rates not exceed 2.5% of the median income in an area, many Detroit households are billed about 20% of their income for water and sewage rates. The average monthly bill is $70-80 a month. 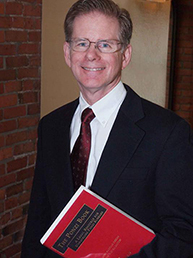 Back in 2005 the Michigan Poverty Law Program, Michigan Legal Services and Michigan Welfare Rights Organization supported the water affordability plan developed by Roger Colton, a consultant working with municipalities to develop low-income programs. A 44-page plan was presented to the Detroit City Council on April 11, 2006. Initially to be funded at $5 million annually through a check-off program for commercial and residential accounts, it would specifically exempt those making “reasonable progress” on back bills from having their water turned off. The program would also explore methods for additional funding from the State Emergency Relief Program for previous arrears. Only a truncated version was passed; it was not even in place when the shutoffs were announced. Why are the shutoffs happening now, when the city is undergoing bankruptcy? The Emergency Manager wants to decouple the department from the city and regionalize it. To do that, he needs to take a hard line against “deadbeats” (a code word for poor Blacks), thus convincing three county boards it will be an attractive deal. By mid-August the media revealed that such a regional authority is being finalized. The proposal will require state assistance to refinance the department’s debt, to cut the 5-6% annual interest rate to roughly half. Presumably the state wouldn’t think of intervening to provide aid to the city! By mid-August the Mayor and the water department came up with a plan — again, only available in English. They will waive turn-on fees and late payment penalties, cut red tape, improve notification for those in danger of shutoff, increase staffing and hold a “Water Fair” to “give customers one last opportunity to connect with all of the DWSD and community resources available before the moratorium ends August 25. What the plan does not address is how people on a limited income can access the water and sewage they need. The August 11 storm in Metro Detroit showed how close we are to disaster. A nine-hour storm dumped 4.57 inches, overwhelming the drainage systems, flooding basements, streets and highways (I-10, I-75, I-94, I-96 and I-696), overturning cars and leaving thousands without power. In some areas sewage and drainage systems are combined. These need to be kept separate, or every time there is a heavy rain, sewage will overflow. A 2001 Southeast Michigan Council of Governments report estimated that sewage infrastructure needed to be upgraded to a tune of $14-26 billion. Meanwhile photographs reveal the contents of basements sitting on curbs awaiting garbage pickup. Headlines scream of mold growing in basements, and predict that roads and embankments will weaken from being waterlogged. The answer cannot be found in the austerity measures being imposed by Detroit’s bankruptcy. In fact, it can’t even be found in a generous water affordability plan that is certainly necessary. The issue is much broader, as the storm brought home. It requires an acknowledgement that access to water and sanitation facilities is a human right and a precious asset. An equitable program requires an end to shutoffs and adoption of a process that protects, not penalizes, low-income residents. It means a commitment on the part of the state and federal governments to update infrastructure and insure public health standards for all residents. Only in this way can we guarantee a sustainable life in our cities and on this planet.